Monsoon comes as a great relief after the hot and humid summers. The first rain is loved by all and many drench in the rain and enjoys a lot. But rainy season is the time when we are more prone to various types of illness. Different types of fevers, cold cough and other water-borne and air-borne diseases are very common during this time. The humid conditions during the rainy times make it perfect for the growth and multiplication of various fungi. So, fungal infections are very common during the rainy season. Bacteria and other germs also breed best when the air is humid. 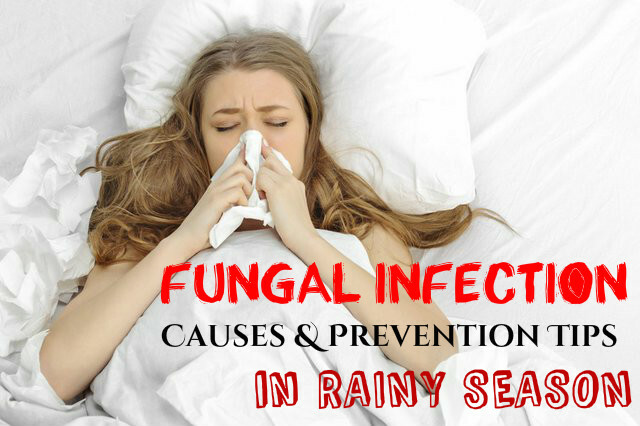 So, rainy season is the time when we are most affected by fungal infections and allergies. Fungal infections usually cause inflammations and itching. Wearing socks regularly and for a long time can cause fungal infection. Wearing tight socks should also be avoided. Using communal pools and baths can make you more susceptible to fungal infections. Walking barefoot in humid areas like sauna or a shower area. If your pet has fungal infection, you may also get it through your pet. From one part of your skin to the other part. By coming in contact with a person who suffers from fungal infection. Often you may have to walk in dirty water during the rainy season. This can cause various fungal infections, which can affect your toes and the nails. So, try to avoid walking in dirty water as much as possible. Keep your feet dry and clean. This way you can protect yourself from fungal infections. You may think that you need not apply any sunscreen when you go out in the rainy season, as it is usually cloudy. But even in cloudy days, the UVA and UVB rays of the sun can damage your skin and cause various skin problems. So, it is important that you apply a sunscreen to protect your skin. Rainy season can cause cracks on the skin of your foot and hands. So, it is important that you use a good quality foot and nail cream during this time. Apply the cream every day at night before you go to sleep. This will prevent cracks from appearing on your skin and keeps your skin fresh and healthy. When the skin has cracks on it, germs can develop easily in these cracks. So, apply the foot cream regularly and this helps in keeping your foot clean and crack free. During the rainy season, avoid wearing socks, as these keep your feet humid and cause fungal infections. You can wear footwear that do not cover your feet completely and let your toes be free. This way you can prevent accumulation of sweat and contacting any fugal infection. If you have to wear socks, then make sure that the footwear you wear is airy and allows your feet to breathe. During the rainy season, you may not sweat as much as you do in summers and the water may be quite cool. You may have a tendency to skip taking a bath under such weather conditions. But it is important that you take a bath every day even in rainy days. Otherwise bacteria and fungi may accumulate on your skin and cause various infections. You can use warm water to take bath. This will help in preventing the growth of bacteria. If you have a tendency to sweat a lot, especially in between the toes, then the best way to prevent your feet from getting humid is to use a talcum powder. This helps in controlling the sweat and keeps your feet fresh. Germs find it easy to breed when the environment is humid and sweaty. By keeping your feet sweat free, you can prevent the growth of germs, thereby getting infected. Sometimes, even after taking proper precautionary methods, you may still get infected by fungi. Then you can follow the home remedies given below to treat the infection caused. One of the easiest ways to treat and avoid fungal infections is to use an antibiotic soap or hand wash like Dettol. This will kill or germs and keep your skin germ free. You can apply herbal and ayurvedic packs in between the toes. These packs are made of natural ingredients and help in keeping your feet clean and free from infections. You can mix turmeric, neem and sesame seeds and make a paste. Apply this on your feet and between the toes, and wait for a few minutes. Wash off with water. Lime is also good for treating fungal infections. Take warm water in a tub and put some lime wedges in it. Soak your feet in to this water for 15 to 20 minutes. This can cure fungal infections and keep your feet clean and fresh. Using neem face wash and shower or soap regularly can help in treating fungal infections because neen has anti-fungal properties. This helps in curing the infection and protecting your skin from further infections. Take a glass full of warm water and ad one teaspoon of honey to it. Drink this on an empty stomach. This can help you flush out all toxins from the body. As a result, your skin will stay clean and germ-free. So, along with enjoying the rain, follow the tips given above. Maintain proper hygiene and take good care of your skin and health. Try to avoid humid conditions. This way you can stay healthy and free from any kinds of infection.